The home energy management industry has become saturated with new players looking for creative ways to be heard among the crowd. That’s at least part of the reason why People Power, which says it’s developing plug-and-play devices for monitoring home energy use, plans to launch a Facebook app on Tuesday that calculates the amount of carbon emissions users have avoided emitting by turning off heaters, clothes dryers, PCs and other home appliances (the energy saved is based on what users say they will do, not what they’ve actually achieved). 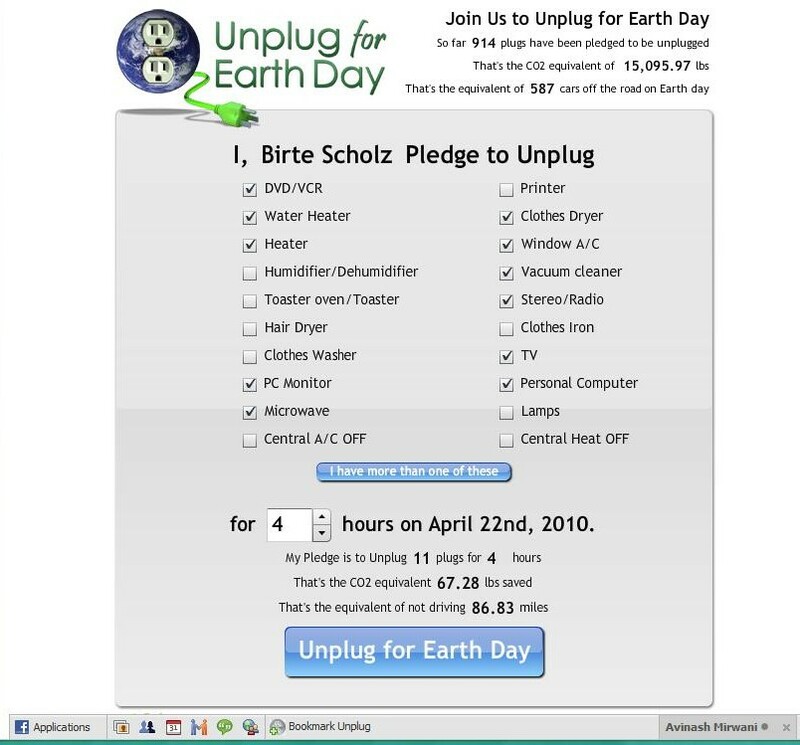 The Facebook app asks users to pledge to “unplug” one or more home appliance from a list of 20 during Earth Day. The user selects how many hours those appliances will be turned off, and the app calculates the emissions avoided and what the rough equivalent would be in terms of miles driven in a car. “Unplug” users can invite friends, view their friends’ commitments, and track their collective emissions reductions. “If we band together then we can make a difference,” People Power Chief Executive Gene Wang told us. People Power, which is backed by New Cycle Capital and plans to launch its core products later this year, aimed to make the app fast and easy to use. Based on my quick test drive, they’ve at least accomplished that. Whether the calculator receives “viral adoption,” as People Power made it clear it hopes for, of course remains to be seen. In addition to the app, the startup also decided to go musical — it launched the “People Power Band” (we’re not kidding) and produced a single called “Happy Birthday Mother Earth,” which is available for download on the company’s website. The marketing push, effective or not, at least underscores People Power’s emphasis on the consumer. When I spoke with Wang before the startup’s launch last year, he told me one of the ways People Power would differentiate itself would be with a consumer-friendly product design. That could be a smart move if retail becomes a key distribution channel for home energy monitoring devices in a few years (after the current surge dominated by utility distribution deals). There’s a variety of Facebook applications and iPhone apps already out there intended to help users cut carbon, by reducing home energy consumption and driving times in vehicles. Last March at Green:Net 2009 we featured a panel that looked at how difficult it’s been to start a web-based social movement around fighting climate change. However, sites like 350.org, founded by Bill McKibben, have more recently found some success at galvanizing young people on the web around “350,” the upper limit of carbon dioxide parts per million in the atmosphere. Leading up to the Copenhagen summit in October 2009, 350.org was able to help organize what it calls “the most widespread day of political action in the planet’s history,” with more than 5200 events in 181 countries. Seems to me a big deal over very little. One day of lesser resource use? And to facilitate that they’re causing compute cycles and server computers to be deployed. I suppose it’s a touchy feely sort of consciousness raising activity, and maybe the intent is that some will chose to make the change permanent. But do you really think that will happen? Won’t it be like New Years Resolutions along about Jan 10th? My wondering question is – what sort of event or message will help people to internalize the need for change, so that the change flows from inside them. As it is this is an externally influenced change. What will make a real benefit to the whole situation is for lots of people to adopt and internalize different ways of living so that it’s not anything special to recycle and not by useless crap and walk rather than drive etc.